Hi there, I hope you're doing well, and enjoying your jaunt around various blogs for inspiration! Stamp sets: Stippled Blossoms (flowers)^, Butterfly Basics (sentiment) and Watercolour Wings (butterfly) and Dots for Days. Cardstock: white (from stash) and Blushing Bride. Inks: Blushing Bride, Craft^, Crisp Cantaloupe^ and Lawn Fawn Wild Rose. Others: Pink satin ribbon (from stash), glue dots, stampin dimensionals, multi matte medium glue, wink of stella pen and stardust stickles. For this card, I stamped the flowers on white cardstock, cut it down and glued it to the bottom of the cardbase. I covered the lower portion and then stamped the dots for days on the upper portion in craft ink. 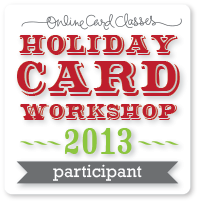 I cut a slit in the card fold for the ribbon and placed a bow on top with glue dots. 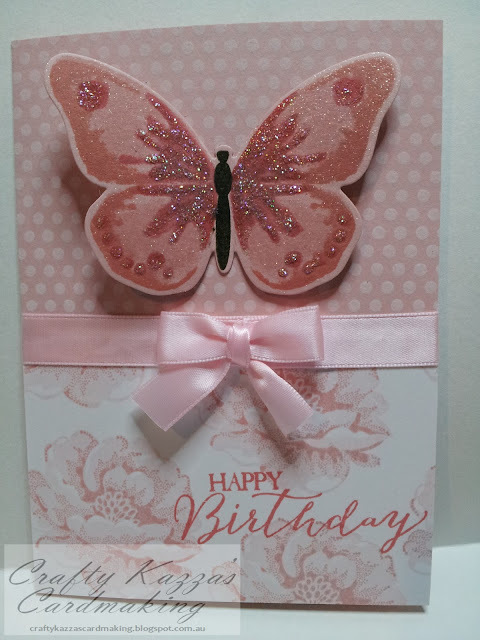 The butterfly was done last night using the pink coloured inks, stickles and wink of stella shimmer pen. That was glued at the top and a dimensional cut in half and placed under the wings so they remain fluttering. Finally the sentiment was stamped on the bottom. I hope you like it! Thanks as always for stopping by and commenting, many thanks for both!